I kept meaning to jump in once were back but I never remembered to have my husband take a picture of me before I changed. 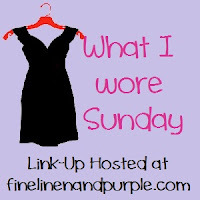 This week I remembered! And he went into photographer mode like I was a model and took 12 pictures! It's been really cold this past week in New England so I call this the "winter chic" look. I was talking with a friend recently about how winter is more challenging for finding cute things to wear to church. My default in the past has always just been throwing on black pants and a sweater. I've been really trying to be more creative this winter though and I have yet to wear the same thing twice and have worn black pants only once. I also haven't really been adding much of anything new, just shopping some old stuff I found at my parents' and discovering new combinations. I was gathering some inspiration by looking at everyone's WIWS posts and brainstorming while we were in Germany so that has helped and I thank all of you ladies for that assistance! 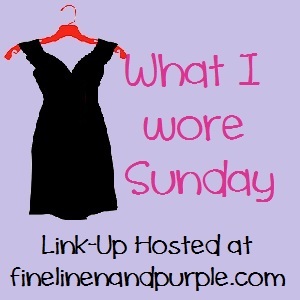 For more What I Wore Sunday, click here. Thanks, Jess! Don't you feel so accomplished when you can find those new combos? What a cute picture - kudos to the photographer. Glad to see you are wearing warm boots. I have proof that your sweater could be 10 years old: a picture of you and Brice from January 2004 with you wearing that same sweater. I am right there with you. No shopping for me. Relying on recent Christmas gifts and what I already own. It's challenging but fun, I must admit. Your looking good! All the best from the Holy Land! Thanks, Jessa! I totally understand having to adjust your look to accommodate walking, but it must be frustrating sometimes. I have had to do that sometimes and wanted to tell people, I would have worn something cuter but I had to wear comfy shoes to walk and comfy shoes look silly with skirts, etc, etc, etc...I've been enjoying the challenge I gave myself to come up with new things and I hope you do too! I get into a mode of skirt w/ tights w/ same black boots. But that's okay- so long as we feel Mass-appropriate, then we're good! Love the print on your sweater. Thanks, Kinsi! This was actually the first time I wore the boots to church since they aren't exactly "dressy" boots but more for warmth. All but one of the women in my RCIA class wears UGGs and usually jeans every single week though so I figure I'll never be too casual in their eyes! Haha, and yes, there's just this little piece of hair that was kind of falling in my face, not keeping in line and not really looking on-purpose either. One of those things that probably just bothers me...Thanks for stopping by!